Here's the final painting I did while at the residency - I may well do more at home, but these five were completed while abroad. This one is acrylic and watercolor on aquabord and it's titled Darker Side. The second day we went into Camallera in the morning with her car so I could stock up on groceries beyond what would comfortably fit in my backpack. I accidentally bought yogurts with sucralose in them again. This always happens to me when I'm traveling internationally, so you'd think I'd learn, but I always am so wrapped up in making sure there's no gelatin in the new brands I encounter that I completely forget about making sure they don't have artificial sweeteners. I just hate the taste. And I bought eight of them. We'll see how many I can force myself to eat before I throw the rest away. Clara also had to run an errand at a donkey farm, and mentioned in passing that she didn't think I'd be interested in going at all, but... WHAT??! 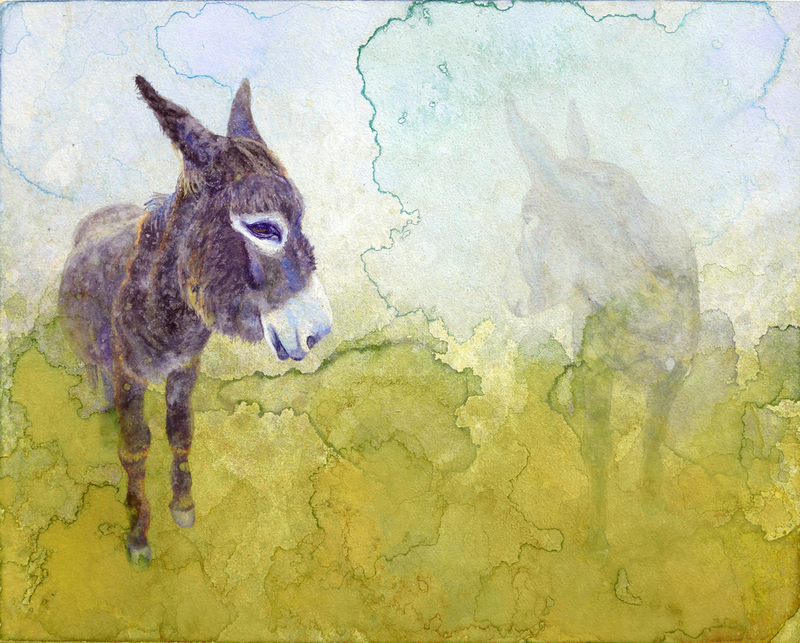 Yes, the person who applied to your residency with paintings of animals and abstracted natural landscapes does in fact want to join you on your excursion to a donkey farm. We arrived at the donkey farm and it pretty much immediately started to rain. But these were not your typical North American donkeys. These were Catalan donkeys, which have ridiculously proportioned ears and are super adorable and sweet. So despite the rain, I took a ton of source photos of the donkeys in between scratching their ears and trying not to step in donkey poo. My poor camera. I kept tucking it under my shirt for the worst of the rain, but seriously, this camera is a trooper. I also encountered an insect called a hummingbird hawk moth, and it is a magical creature. As in, it appears to be a unicorn/fairy/not of this world. The rest of the day passed in a very sleepy, leisurely, jet-lagged state. I did manage to get outside long enough to note that A) there are a lot of snails around Nau Côclea (to which Clara responded that côclea comes from the latin for spiral) and that B) there are a TON of ants. As in, if you stand still outside for more than two seconds ants will swarm onto your feet and up your legs and bite you all over. Clara commiserated and said she accidentally made them a home here with her when she installed underground drip irrigation and that she'd brought an entomologist in but they said there was nothing that could be done. There is a powder she gave me that I can sprinkle just outside my doorway to try to keep them more out than in. The third day was spent entirely on drawing and painting. The entryway to my house. Clara with two of the donkeys. 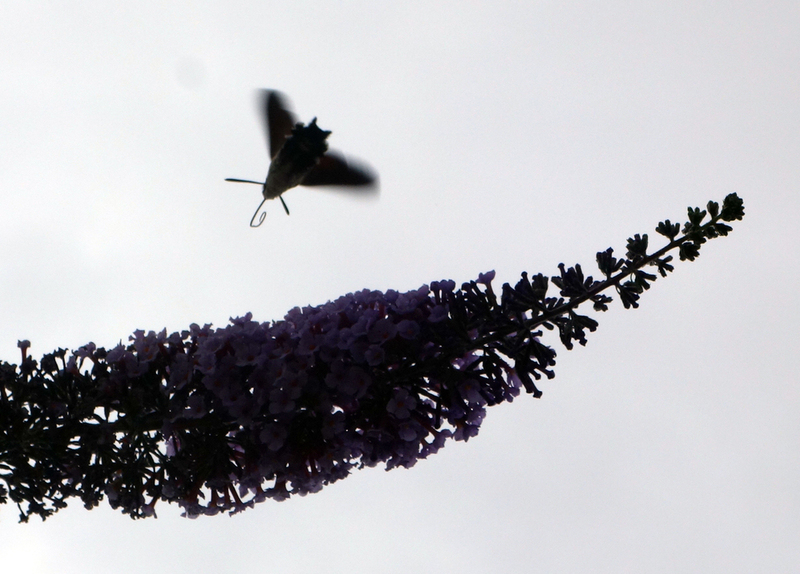 A semi-silhouette of the hummingbird hawk moth.